LEXINGTON, Ky. (Nov. 1, 2018) – It's been over three years since UK HealthCare's Kentucky Children's Hospital and Cincinnati Children's Hospital Medical Center entered into an ambitious partnership to provide pediatric heart surgery services to the families of Kentucky. The two medical centers launched the Joint Pediatric Heart Care Program (JPHCP), a "two sites, one program" model that combines the strengths of UK HealthCare’s advanced subspecialty care with Cincinnati Children's, one of the country's leaders in children's health care. "We are delighted that the years of careful hard work that our joint program did prior to restarting congenital cardiac surgery has led to such outstanding results for the children of Kentucky," said Dr. Andrew Redington, chief of pediatric cardiology at Cincinnati Children's. "Our work continues, but the future looks very bright indeed." "The goal has been to provide care closer to home," said Dr. James Quintessenza, chief of pediatric cardiovascular surgery at Kentucky Children's Hospital. Dr. Quintessenza, or "Dr. Q", as he is known to his patients and staff, also holds a joint appointment as an attending physician at Cincinnati Children's. "We match the complexity of the patient and their needs for surgery to the evolving capabilities of the Lexington campus." The partnership has been a quantifiable success. In October 2018, the JPHCP reached its first major milestone: 100 surgical cases. Each case is unique, much like the stories of the young patients involved. For Jason and Jenna DeMastes, the joy and excitement surrounding their first pregnancy was tempered by sobering news; prenatal testing showed their child had a number of birth defects, including a heart defect. After a number of tests and a six-week hospital stay, the DeMastes welcomed a baby girl they named Faye. Faye was diagnosed with VACTERL association, a series of birth defects that affects many of the body's systems. She had four out of the seven possible defects; esophageal atresia, where the upper esophagus ends and does not connect with the lower esophagus, trachea-esophogeal fistula, or an abnormal connection between the trachea and the esophagus, a sacral dimple and a possible abnormality that affects her vertebrae, and a cardiac condition called Tetralogy of Fallot, a rare condition caused by a combination of four defects in the heart. At five days old, Faye underwent a procedure to correct the esophageal atresia with trachea-esophogeal fistula. As she recovered, the DeMastes worked with Faye's doctors on a plan to correct the defects in her heart. "There was nothing scarier to me then knowing my child needed to undergo open heart surgery," said Jenna DeMastes. "The fear, the worry, and the unknown was very overwhelming and it was hard to grasp what exactly we were about to go through. In our initial meeting with Dr. Q, we felt like Faye was his only priority. My husband and I didn’t feel like another family nor did we feel like this was just another surgery for him. We felt more comfortable with the procedure and more at ease due to his confidence." Jenna and Jason had the option of going to Cincinnati for Faye's surgery, but opted to stay close to home in Lexington. 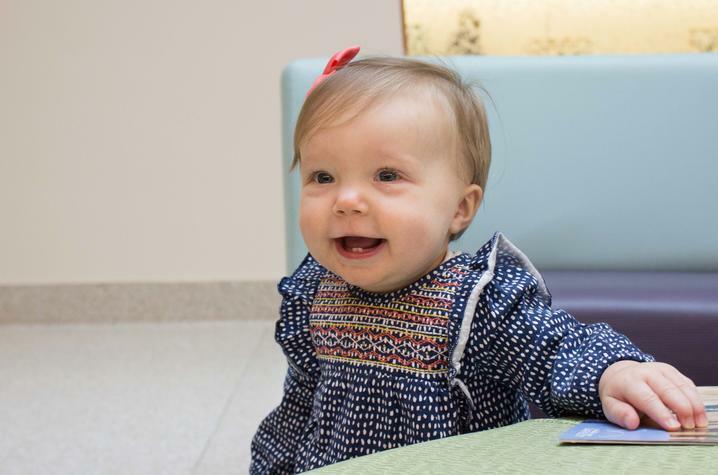 On April 4th, 2018, Faye, then six months old, underwent surgery to correct the Tetralogy of Fallot, which included closing a hole in her heart, and enlarging the narrow passageway between her heart and her lung circulation. This procedure will preserve her pulmonary valve and hopefully minimize her need for surgery in the future. After six days in the hospital, Faye was home with her parents. "Everyone, from Dr. Q to the doctors, nurses to Rachel our social worker, worked as a team and showed such compassion towards Faye and for us as our daughter went through surgery and recovery," said Jenna. "It was a very long and tiring week in the hospital, but we felt supported emotionally, checked on financially, and felt like we were given the knowledge to continue Faye’s recovery at home. The care was beyond our expectations and we are forever grateful to UK and Dr. Q." As the JPHCP moves past the 100th procedure, Dr. Quintessenza, Dr. Redington, Dr. James Tweddell, director of cardiothoracic surgery at Cincinnati Childrens, as well as the team of physicians, nurses, techs and staff are gearing up to take on more complex cases at KCH. UK HealthCare staff participate in intense on-site training at Cincinnati Children’s while also investing in infrastructure enabling success through telehealth and other technologies, and specialized equipment and supplies. "As we've been very happy with the results in the patients we've cared for, we're increasing the complexity and the number of patients we're able to care for at UK," said Dr. Quintessenza. "One of the things I'm most proud of is the collaboration between caregivers to allow patients with critical heart disease to enjoy improved health and hopefully near-normal lives." 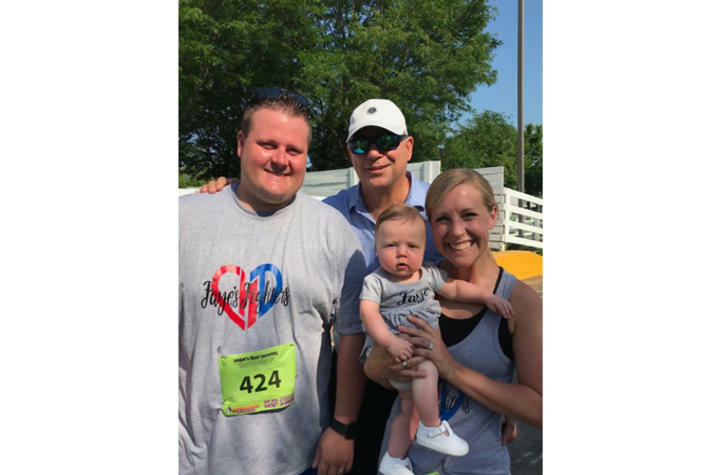 Three months after Faye's surgery, her family and friends gathered at Lexington's Keeneland Race Course for the Wild Hearts Superhero Race, a fundraiser for Kerrington's Heart. Wearing their "Faye's Fighters" t-shirts, the DeMastes reconnected with many members of Faye's care team, including Dr. Quintessenza. "It was so amazing seeing them again and knowing how happy they were to see how great Faye was doing," said Jenna. "For them to come out on their Saturday off to support these children and their families just shows their true compassion and love for what they do."